So the weather has been pretty awful recently hasn't it? Several times I've walked home from school with Midge clutching my hand ever so tightly shouting, 'Mummy! I don't want to blow away!' Bless her, at point I was carrying her back home and she's not a small 4 year old! As it's been pretty horrible here in Cornwall I've been donning my welly boots (which I love) on almost every school run for the past couple of weeks. If there is one thing that's going to send me blasting back to my childhood, acting like a total fruit loop in front of strangers and not gibing two hoots, it's going to be popping on welly boots and splashing in puddles! You know what's even more fun? 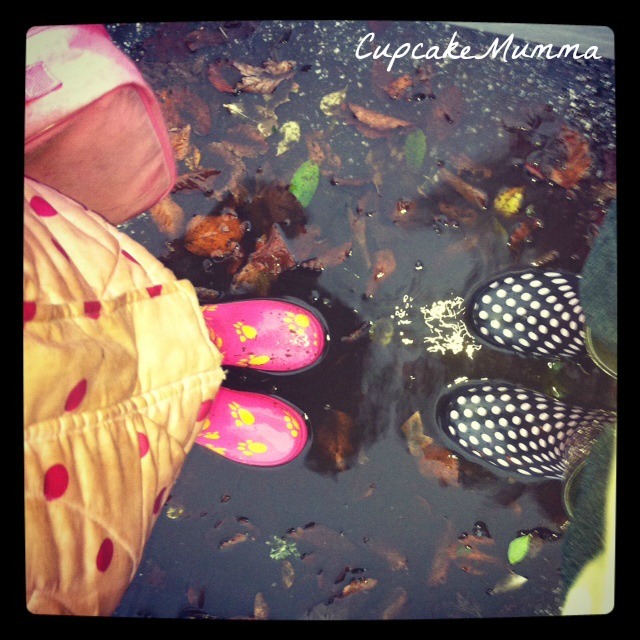 Splashing in puddles with Midge! As long as you're safe and wrapped up warm, do go puddle jumping too! It’s been a relaxed few days here in the Cupcake House but there are a lot of things lined up to keep the old mind ticking over. Every single day so far Midge’s school has stuffed a letter into her little red book bag about some event coming up or the need for more parents to help out. Next week for example, I’m at the tree decorating ceremony in the hall in the morning. I have to make sure I’m there nice and early and have to make sure Midge’s decoration is made and completed by Friday so she can hang it up on the school tree. Apparently the best one in each class wins a prize or something like that so, as you can imagine, she’s keen to make something pretty. I have to start make her an Angel outfit for the upcoming Christmas play. Midge has been chosen as one of the angels so I need to put something together that she’ll both love and feel comfortable in. My Mum would make our costumes for our Christmas plays every year. You would never catch her buying them. 1, the outfits can look pretty awful and 2, money was better spent to be honest! I’m keen to follow in my Mum’s footsteps and create something for Midge. I am yet to figure out my sewing machine but will not give up. I have had a brain wave though! Midge still has her bridesmaids dress from our wedding day in her toy box (it’s now a princess dress apparently!) so all she needs is some tinsel sewn on the bottom, some wings with more tinsel sewn on and something pretty to dress up her head. My mum used to make me a little halo out of tinsel and something else but I’m thinking of a really sweet head band, circle shaped to sit on her head with pretty flowers on it. Bit hippy-ish I suppose but lovely! On Tuesday we have the parent and child Christmas Workshop. We put our names down to make some Christmas trees. No idea how fun this will be but Midge and I will get some ‘us’ time and there will be some Christmas artwork on the walls! Wednesday I’ve volunteered myself to go on a trip to Eden Project with all the children from reception, so I’ll be hopping on a coach and spending all day in St.Austell to help them with lunch and playing on the ice! That leads me to Friday (thank goodness for Thursday!) On Friday it’s the Christmas Fare at school so we’ll all be going including my beautiful little niece. We’ll look after her an hour whilst my sister-in-law helps out. There will be lots of little bits to buy and we have a very important appointment with Father Christmas Himself at 2.30pm for Midge, Little Man and my niece. Be great to see how that turns out! I’m really looking forward to next week and of course this week I get to put the decorations up! Midge wanted to see what the tree looked like so I put it up..Now it’s just sitting there BEGGING to be decorated. It’s only a day early right? This has nothing to do with me chasing rainbows I'm afraid. Not so. 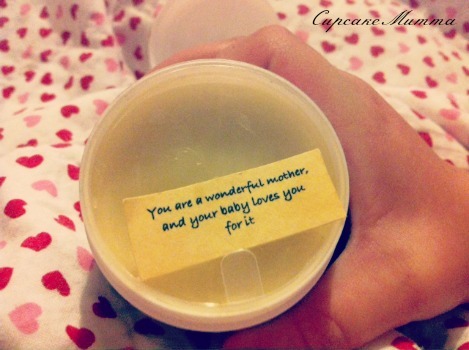 I was recently sent a rather lovely product to review called 'Pot Of Gold Baby Balm.' This baby balm isn't just for babies, but can be used for the whole family. What's so different I hear you ask? Well, check out the ingredients: organic palm oil, coniferous tree sap extract, raw organic beeswax, vanilla essential oil. Do you see anything remotely 'nasty' there? I certainly don't and that's just the first reason why I'd buy this product again in the future and why I'd highly recommend it to other parents and their children. I first used the Pot Of Gold Baby Balm on my son. He's 21 months so still in nappies and unfortunately lately he's been getting a bit of a sore bottom. I've been one to go to those bigger brands that may work but are full of all sorts of ingredients that really most of us (including me) ignore. I have given the balm a fair while to work, just to make sure it really was going to live up to its name! It really is my little pot of gold and I carry it everywhere with me! My sons bottom has never looked so clear and soft. It's usually always a bit red and takes a while for other baby creams to work. This Baby Balm worked much, MUCH quicker. Not only is the Pot of Gold Baby Balm made for babies bottoms, but I was also told I could try it on cradle cap, eczema, stretch marks and also on my dry lips. My lips have been super soft in this horrid, chilly weather and my 4 year old, who had a VERY sore ear (which shampoos and creams even prescribed from the GP have not managed to clear up)is happy again because behind her ear is no longer sore or itchy. In fact it has COMPLETELY gone away! I've used the balm on my stretchmarks when they itch and I have found it to be quite soothing. I imagine it would've been the same feeling my son had once I applied it to his bottom! 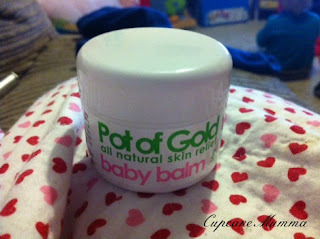 Pot of Gold Baby Balm really is an all over natural skin care product. It has a beeswax base which means you don't have to use a lot. It may be a little pricey for most parents at £8.20 for a 50g pot but trust me, it lasts far more longer then other chemical filled baby products and is just fabulous on the skin. You need the smallest amount on your finger tips, and if the temperature is a little cold, simply rub the balm between your fingers to warm it up. You'll soon see what I mean by a little goes a long way! Pot of Gold is based on a family recipe which is now in its 6th generation and is made in New Zealand. One of my favourite things about this product? If you're having a rather bad day, opening up a pot to use on your babies bottom and seeing this is going to make you feel even that little bit better! Things To Do This Winter! 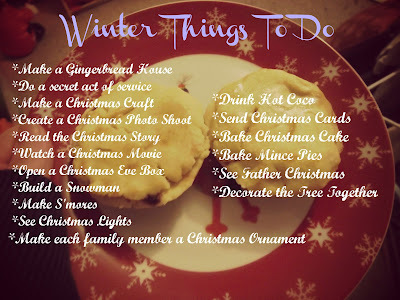 I've made a little list here of all the things I want to do with my children this December. 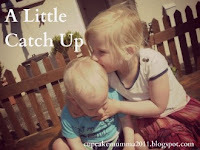 As it's the 1st this week I thought I'd put it on the blog now as something to remind me. Have you got anything planned for winter too? Feel free to pin the image but please make sure it links to my page. Thanks! It's not often I'll post something like this to my blog, but a few lovely bloggers have come together to help spread some positive thoughts and energy to Kerry, also known in the blogging world as ''Multiple Mummy.' She suffered a hemorrhage in the brain following a ruptured aneurysm in August. Since then Kerry has suffered some setbacks is unable to speak, move her right side or feed herself. Of course, I like to pray sometimes. I have a 'prayer book' and praying for Kerry is already something I have done. I pray you hear me and many others in this time of need. We all need someone to turn to and for me, that's you. I know a lot of people who don't turn to you in their time of need, so I like to pray for them too. I don't have to worry about feeling silly when I say this. A kind, loving and truly wonderful lady is very ill. I don't know her, her name is Kerry, she's a blogger but she's friendly and thoughtful and has the most lovely family. I used to always read her posts on her blog. Maybe one day our paths will cross? I pray Kerry can heal. I pray that she can keep fighting this tragic illness that has taken her so suddenly and still continues to test her. I pray that she can talk to her husband and her children again. That she can hold them again, and tell them how much she really loves them. I may be crazy Lord, but I really pray she could be home and warm for Christmas. Please watch over her Lord. Please keep her family, her loved ones safe and strong. She needs every single one of them right now. Well, the weather has turned and the school runs are a little wet to say the least! I'm very happy to have my spotty wellies which make this wet weather a lot more enjoyable. On the way home from school, Midge and I did lots of puddle jumping which set me in a rather good mood for the rest of the afternoon! Family fun is always a reason to be cheerful! Little Feet. Oh I just love them! This is Little Man's step by step guide on how to successfully watch TV and find your foot (not forgetting to have a good nibble) all at the same time. Now one thing that makes me cheerful? Laughing a lot! 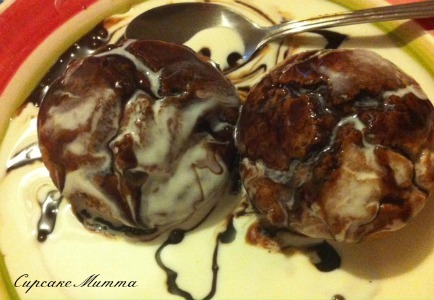 Finally, cake, cream and chocolate syrup. That must be a reason to be cheerful! Please link up and look through this weeks Reasons To Be Cheerful here. I love this time of the month! 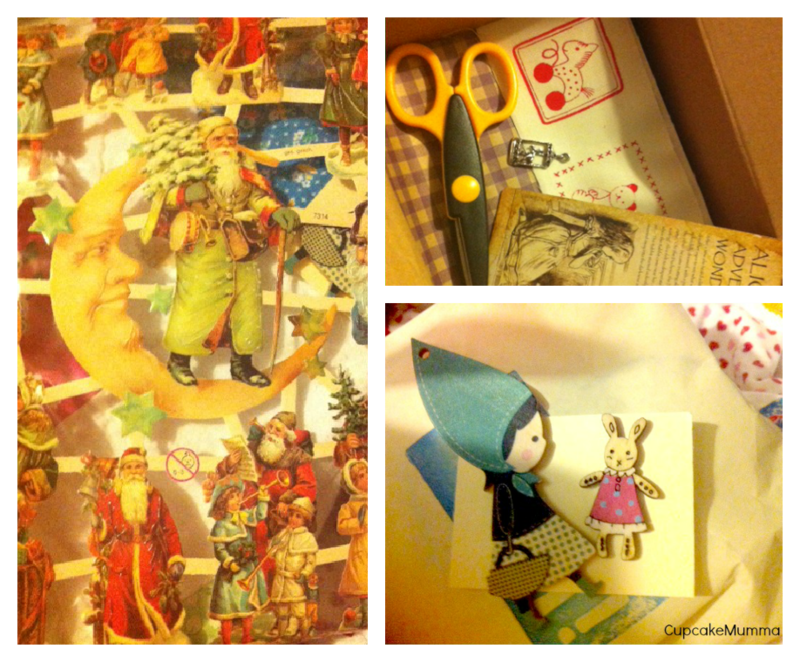 I was so excited (yes, call me sad if you like) to get my next box full of crafty goodies from Crafty Creatives. Yet again, they have not disappointed! This month the theme is wonderfully vintage and festive! If you haven't had your box yet, look away now because I'm about to do some showing off! I always open my box up trying to figure what the theme is from the paper. Last month was easy with its dark black and red rose design. This time the papers weren't really giving anything away! This months kit is..Crochet! Instructions and links are provided along with coloured wool, a crochet hook and all the little extras to finish off this cute design. This will be such a challenge for me as someone who couldn't get the hang of knitting (which I know is different!) but still a bit daunting! A lovely bunch of Cinnamon sticks. Mine are going to go around a nice, medium sized candle as a gift for my Gran this year. I'm also going to make one for myself. Also there is some beautiful ribbon, small wreath hoops which I can't wait to make up all festive. There is a mini teacup and saucer (not pictured) which I will make into either a ring or pendant. It really is adorable. Last but not least, some jingle bells! 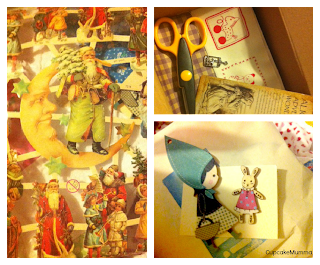 I love these very festive images sourced from Germany, aren't they just lovely? There's also a cutting of fabric specially made for this box, a pair of scissors which I was going to ask for for Christmas- handy! I've wanted a pair of scissors to make my cutting a bit more funky! Finally, aren't these wooden images just too cute? I really don't think I can part with this item so may have to make something just for me and my home. 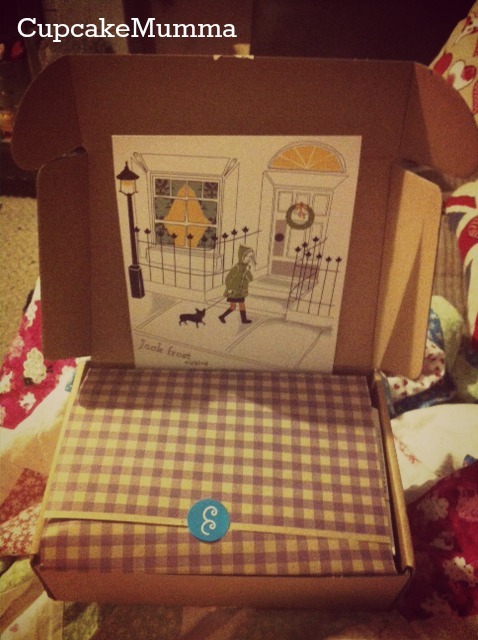 If you have received your box, what are you planning to make with this months festive collection? 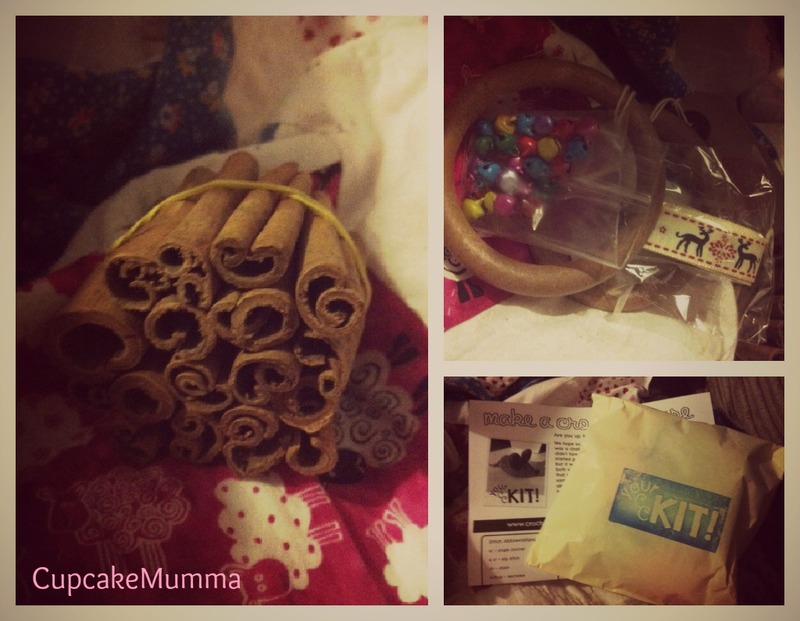 Are you a bit daunted by the kit this month too? Have fun and share your makes! 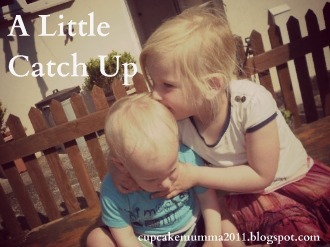 When Midge was a baby she had croup a few times. It wasn't pleasant but sounded worse than it actually was. A swift visit to the GP confirmed our thoughts and we went off to go back to our Olbus Oiled bedrooms and steamed bathrooms. A few days later she was right as rain and we never heard from croup again! It was 5am this morning however, that we had a return of this here croup. Actually, at first it wasn't apparent what was wrong. The house was quiet then..Scream. My Little Man was screaming, panicking and it was terrifying. I calmed him down taking him into my bedroom for cuddles. It was then that we heard the oh so familiar sound of that seal-like bark. 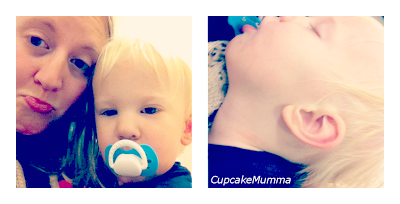 Something was different with this case of croup though and that was that Little Man was really struggling to breathe. In the end we called an ambulance. As soon as the crew walked in they knew what was wrong. We sat with him in the bathroom and gave him some Anbesol to help his teething which was stressing him out. His temperature and pulse were high and the crew agreed that it was best to take him in. I was so scared it was unreal! I did feel bad at first, here I was with a baby with common croup when someone could be laying at the bottom of some stairs...I soon left that thought behind though, I know I was right and who really likes calling out the ambulance anyway? Once in the ambulance his temperature went up a little bit more as did his pulse. He had some more Calpol and was put on the nebuliser which was the same as sitting in a steamy bathroom just with the added benefit of saline to help his chest. I can't thank the paramedics enough, they were so supportive, helpful and kind. Even when I sprayed Calpol all over the place and had to have a whole syringe re-filled and passed to me! it would've been really boring! 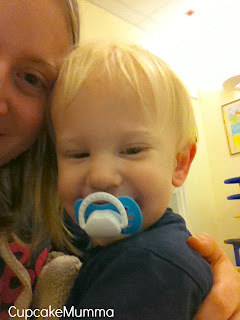 The nursers and doctor at the hospital were just as lovely and helpful. Little Man and I waited in a fairly large room on the bed surrounded by Gruffalo wall stickers and toys. He was weighed and had his temperature taken again which thankfully had started to return to normal. Because he was still quite wheezy he was given a steroid solution which we have brought home for him to have over the next few days. He's on the road to recovery now! We've taken on board all the advice, some of which we already knew from Midge's encounter with croup, given to us by the nurses and paramedics. Both my precious babies are tucked up in bed. Hopefully Husband and I can go and stay in our beds a little longer than this morning! So here we are. Friday. The week hasn't ended in such a great way in all honesty. Not long until Christmas and my washing machine has decided to go bust. On the positive side we have the money to replace it. On the not so positive side, said money is from our 'holiday' (read Honeymoon) fund which isn't all that much of a fund to begin with in all honesty! Oh well, clean clothes are a necessity and maybe we can recover the loss! It's certainly time to look for some cheerfulness in my week that's for sure! 1) I've started my making Christmas cards. I've chosen a really fiddly idea which isn't ideal but now I've started I can't stop can I? It's on my bucket list to make all my Christmas cards one year and I thought I'd make that this year. Coming along nicely no? 2) I had a parents meeting tonight at Midge's school. She's doing really well and I'm so proud of her. She's settled in great, is friendly, kind and helpful and loves to help the teachers. Her phonics is a little slow but her teacher has told me she isn't concerned because she feels once Midge picks it up she'll be well away. 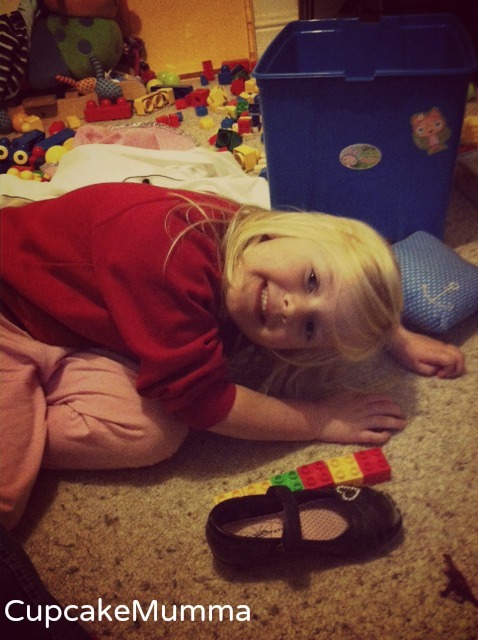 Apparently she loves maths which I have noticed at home! 4) I have done some decorating in the house and it feels so nice and homely at the moment. I can't wait to pop my Christmas decorations up this year and make the place feel warm. Now what I really need, is a nice long lay in, my washer to miraculously repair itself and my Husband to not get so drunk tomorrow that he can't find his way home! Do you have a Carbon Monoxide alarm? If not, you are not alone. According to the new Carbon Monoxide- Be Alarmed! Campaign that has recently been launched, at least 35 million people across Great Britain are at risk from Carbon Monoxide poisoning. It wasn't until recently that I myself had a Carbon monoxide alarm fitted in my family home. Carbon monoxide alarms are just as important as fire alarms but it's clear to me that there just isn't enough awareness. Because we know so much about fires and hear so many frightening stories in the press, families make sure they have fire alarms fitted in their home. It was the first thing we did when we moved in. So why didn't I fit a carbon monoxide alarm at the same time? In all honesty I questioned my landlord about posting us one along with a new fire alarm, but I was met with a raised eyebrow and told "Ah, it's not important. You won't need one of those." I don't want to be the one regretting not getting an alarm, and now I have one I feel so much safer in my home. Carbon Monoxide- Be Alarmed! have put together some great infomercials. I'm so pleased to be a part of this campaign. Please view these infomercials and please, please share them. You may just save a life. * In a study, published by Liverpool John Moores University in May 2012, fire fighters conducted checks at 22,182 properties across Merseyside. 90.2% of the properties did not have carbon monoxide alarms. Please visit the Carbon Monoxide- Be Alarmed! website for more information on Carbon Monoxide, staying safe, real stories and also to find out how and where to buy a Carbon Monoxide alarm for your home. Last year, Carbon Monoxide killed more than 50 people and around 4,000 people were hospitalised. Don't be the next statistic. Fit an alarm in your home. Carbon Monoxide- Be Alarmed! is the national campaign to reduce the number of deaths and injuries caused by carbon monoxide. The campaign is run by Energy UK on behalf of Britain's six major gas and electricity companies in partnership with the Dominic Rogers Trust, and is supported by more than 40 other organisations. For more information please visit the Carbon Monoxide- Be Alarmed! website. You can e-mail the team monoxide@co-bealarmed.co.uk, follow them on Facebook and even Tweet them for advice. 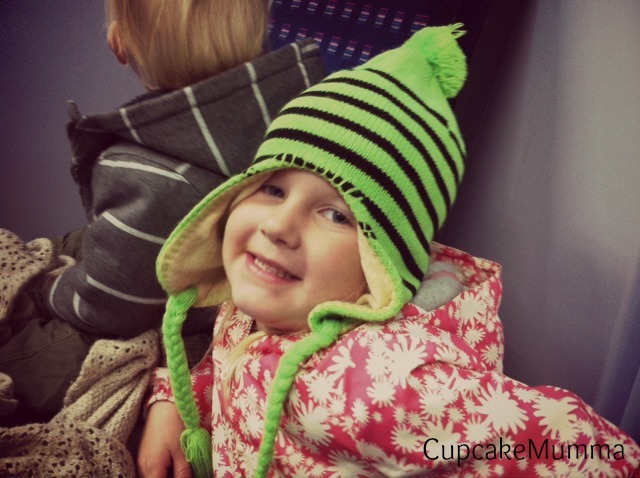 Saturday was a busy day for those of us in the Cupcake House. I usually grab a good lay in on a Saturday, being that it's the day where Husband gets to play his football and then go to the pub until the evening, but this time I didn't have much luck! 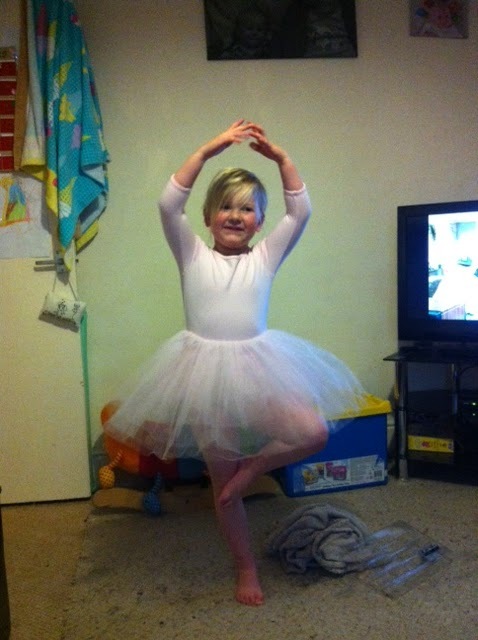 I may* have woken up in a bit of a panic remembering that Midge had her first ballet lesson today and I had to compete with the 'ballet mums,' who in my mind were going to be looking oh so wonderful...I had greasy hair and had fallen asleep in my slippers- i needed a shower! Midge and I had a mad rush to get to ballet on time. I had agreed to meet a Mum friend whose daughter has joined the same ballet class in the hope we wouldn't be late due to my bad geography. As it was she was running late so we both turned up just in time, ushered our girls into the hall whilst being gawped at by the awaiting mums (who turned out on the most part to be completely normal and not so well groomed as I had initially assumed) phew. Midge cried for the first 10 minutes then spent 5 minutes clinging on to me with her thumb in her mouth as I attempted to balance on one foot and demonstrate how to jump gracefully on tiptoes. 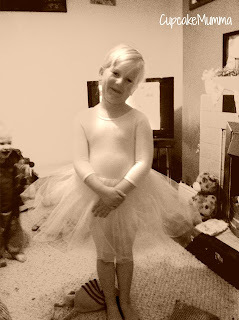 I wasn't the only Mum subjected to looking like a prat so I didn't feel too stupid and besides, I always wanted to be a ballerina and the teacher was suitably happy with me (insert big grin). By the end of the lesson Midge was pretty happy and had enjoyed herself. I'll keep up the lessons for now to see if she can settle better. At the moment she's just shy but as time goes on she won't be such a new face and will hopefully feel able to let me put my feet up and sleep watch. The second half of our day was spent at a little boys birthday party. 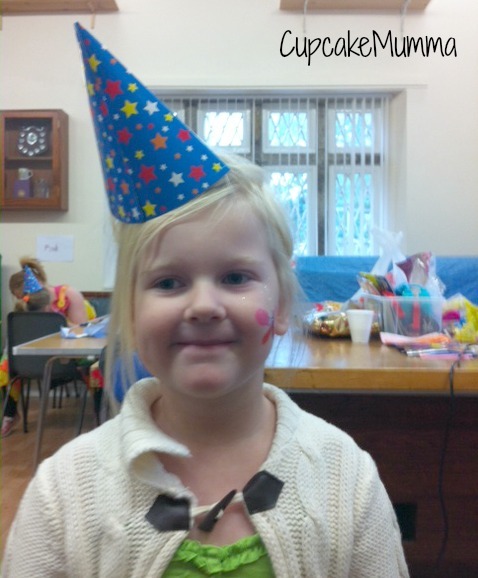 All the Mums from reception invite the whole class so now Midge wants a nice big party just like all the other children. It's great to see them all running around but as a Mum who doesn't get welcomed into the folds I'm always dreading these parties slightly. Saturday was a good day. I even got to scold Husband for turning up nearly 2 hours later than usual. Turned out he had got carried away planning this weekends drinking session whilst watching the football. It was okay, I was cranky because I was worried when he didn't phone or text back. I'm an awful worrier! We made up and had a nice relaxing evening together. Mum and Dad had the children on Sunday which was a day of house clearing for the Husband and I. I'm going to do a separate blog post on that to show off some of our homely finishing touches which have cheered me up no end! I hope you all had a lovely weekend too! Our Half term was getting a bit boring by the end. We hadn't really done anything, hadn't adventured out all that much and were getting pretty bored of baking (yes, it does pain me to admit this!) We were saved from our boredom however by DKLToys, who sent us a lovely package of toys to review! There was a toy for Little Man and a toy for Midge. Midge opened the parcel (her favourite bit!) and pulled out some Miniland toys. First we have a Miniland Clock. This clock is a handy size for your toddler to carry around. 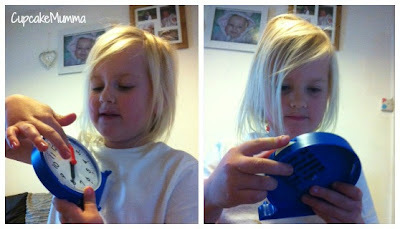 Midge has taken to placing it on her pillow and wakes up every morning asking, "Mummy, what's the time?" to which I reply, " 7 o'clock." She'll tiptoe back into her bedroom and return a few minutes later with her little clock adjusted to the right time. Midge is 4 years old so it's not necessary for her to learn to tell the time. What I like about this product is it makes them want to learn. 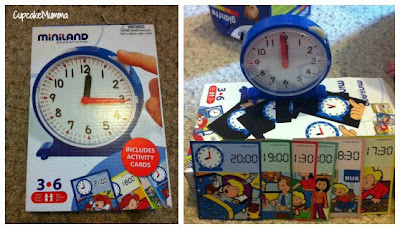 There is a set of cards provided with the clock which allow you to help your child learn the time. Not only do the cards provide you with the diagram to help your little one move the hands correctly, it also states the time digitally and both in a daytime and nighttime format. The only thing with this product is it doesn't hold attention for long. If there is a more exciting toy or activity in the room, the clock will quickly be cast aside. Having said that, the cards are always about the house and the clock, as I said before, is kept on Midge's bed which means she is always curious about what time it is and how to show this on the clock. That can only be a good thing in my opinion! and playing with his toys. The second product we were sent was Miniland Giantte. This is a set of building cups with numbers on. There is also a lid and shapes to practice that good old shape slotting technique. 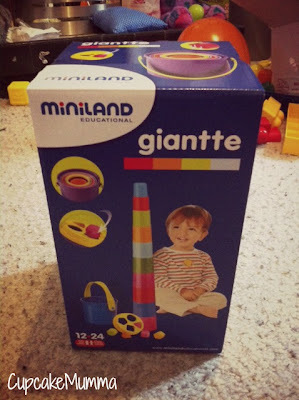 Little Man is 20 months old so this is a product which I knew he'd enjoy and which he can continue to enjoy and benefit from for quite some time. We had a go at slotting the shapes into the bucket but this didn't hold his attention for very long. 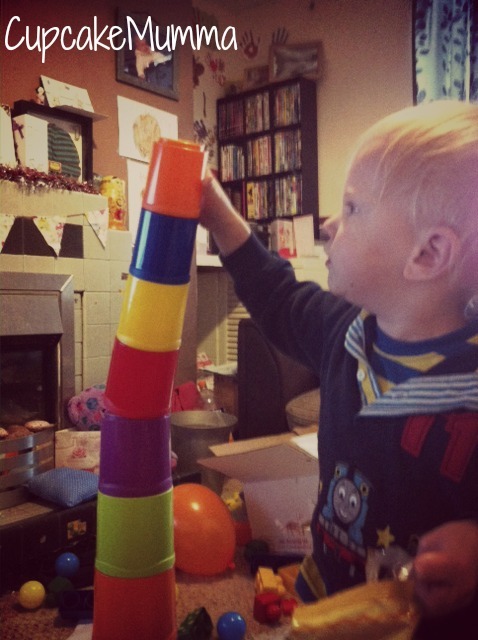 I left him to play by himself and with Little Miss before having a go at building the tower with him. Turning the bucket upside down, the cups are numbered 1-9 which is great. 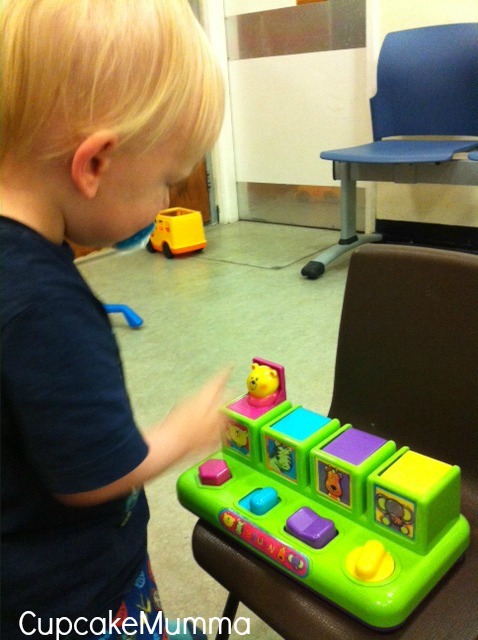 You can count together with your toddler and your toddler can start to recognise the numbers. As Little Man is too young to count and recognise numbers just yet, I counted them out loud whilst handing the cups to him. I believe it's never too early for number and alphabet learning. My two played together for nearly an hour with no squabbling! 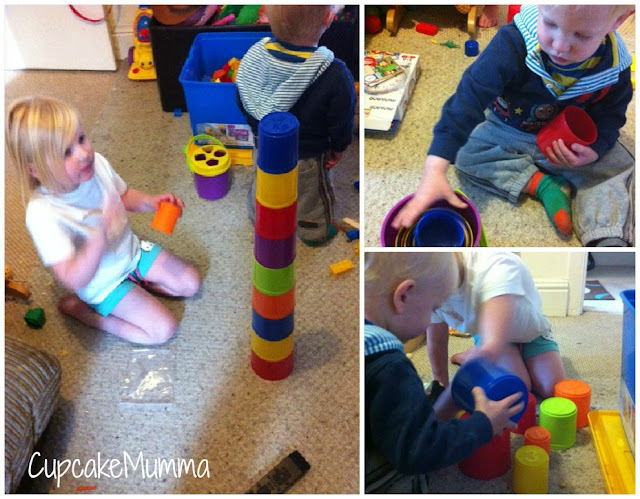 Midge helped Little Man to build the tower, counting the numbers as she went. I enjoyed leaving them to it for a bit and loved how this one toy brought them together. Most children love building towers and from counting to shape sorting to naming colours, its a really great educational toy. I have no faults with the product at all. We were also sent an animal mask to make and show off which I will post as soon as Little Miss and I can have some one on one time so please do look out for that if you have some crafty creatives amongst you! After all the poking people in the direction of my link to share their fabulous mugs from my UK Mug Swap, I forgot to show off my lovely mug! I partnered myself up with the lovely Claire from Claireabellemakes. Please visit her blog, she's friendly and so crafty. I love spending time reading her posts and seeing what she comes up with. Below is the mug she sent me. Very Hannah I must say. I even got some Cadburys hot chocolate which is my favourite. We don't drink tea or coffee so it was an ideal swap really! As another little extra, Claire sent me this rather cute button ring which she makes and sells from her Etsy shop. I love pink, I adore polka dots so it's a win win as far as lovely little surprises go! Thank-you to everyone who took part in my UK Mug Swap. Overall it seems to have been a total success. 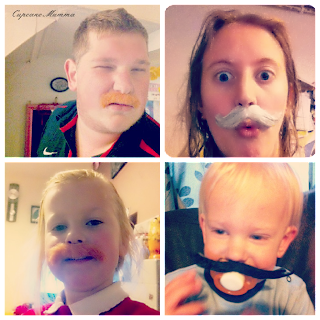 If you participated I would love for you to take a photo and link it up here so we could all see these lovely mugs! I hope friends have been made and I may take up another swap next year. You know when there are so many things you want to do and yet there feels like there's no time at all to do it? That feeling you get when you walk around your home and see the laundry pile that is crying out to be folded and put away, the children's room is a mess and your rooms are all cluttered...you start eyeballing everything, contemplating chucking it all away. At least then you could do what you really want to do. I really need to exercise. At the same time I need to eat dinner and run up and down the stairs at least 6 times to get my children to nod off. After all the washing up, laundry tasks, popping to the shops (all the day to day stuff) I really just want to pop my feet up with a hot chocolate at the end of the day. I also want to craft. 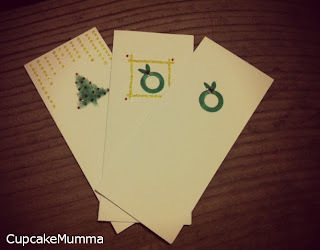 I love taking part in swaps and I want to make my own Christmas cards this year. Then there's studying which is a priority really. Not that I've picked up my books in 2 weeks...Naughty, naughty..I don't think I have too much to do. Not really. It's just that I want to do all the fun things all the time and all the crappy stuff gets in my way! Not to mention my quilt and sofa are much more appetising than walking around this drafty house doing chores! How do you 'fit it all in'? Do you? Do you sacrifice those boring chores in favour of a quick crafty session? Or do you feel you have to get everything done before settling down to projects, dinner and work outs? I'd love to know! As I mentioned in a previous post, I'm not all that keen on Bonfire Night. However, I seem to have had a change of heart all of a sudden. Seeing Midge and Little Man get all excited when they heard the bangs outside and Midge desperately peering out the window to see the fireworks, seems to have made me feel a little different about the event. We started off by wanting to make toffee apples...but I didn't have enough of the essential ingredients. So, we looked for some chocolate in order to make chocolate covered apples! 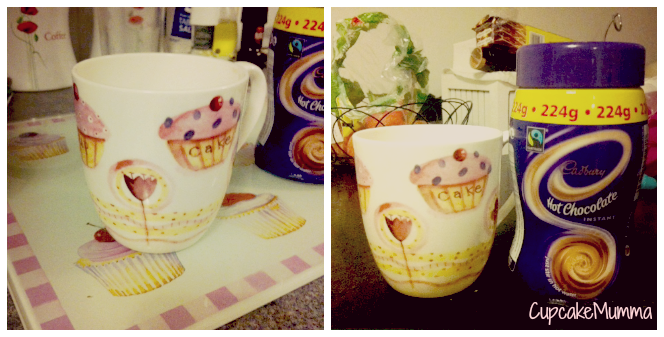 I didn't have any chocolate in the cupboard either...I did have marshmallows though! 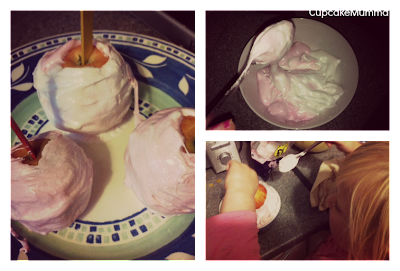 We melted our marshmallows (which I wasn't sure you could do and am slightly annoyed that you can do this after buying the American marshmallow Fluff for £2.99 over the last few months) I have to say, marshmallow apples beat toffee and chocolate apples hands down for me! 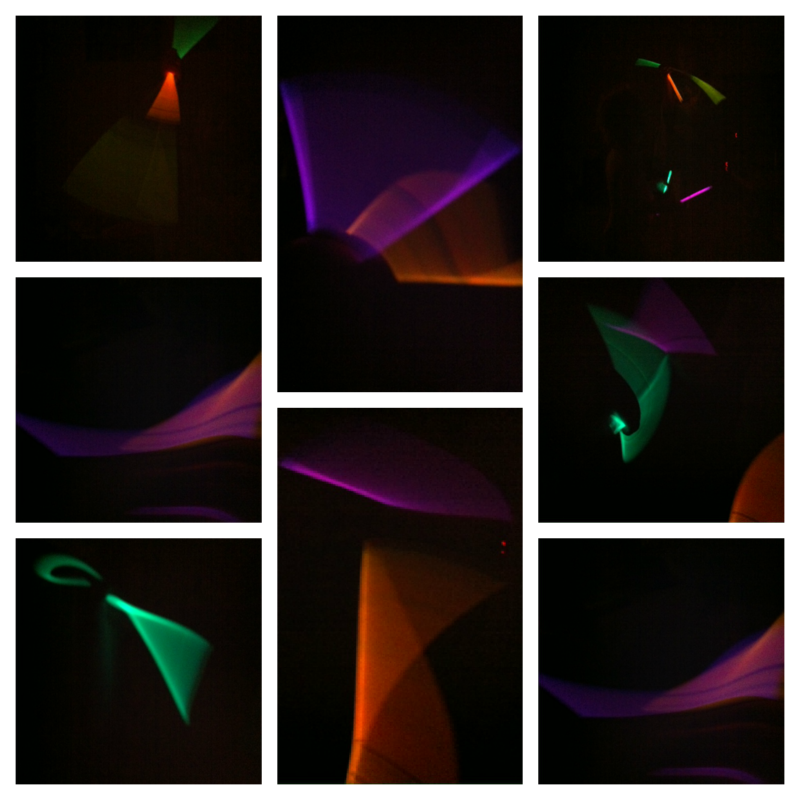 After we had dinner and had tucked into some marshmallow apples we went into the front room, turned the lights and TV off and whipped out our glow sticks! Little Man had such a great time playing with the glow sticks and went absolutely nuts dancing around with them. Midge had a great time swishing them around and letting me take photos of her in action! I really love how these photos turned out. I Can't wait to show Midge tomorrow. Finally, as there were no firework displays we could get to this year we went into our back garden and lit some sparklers. 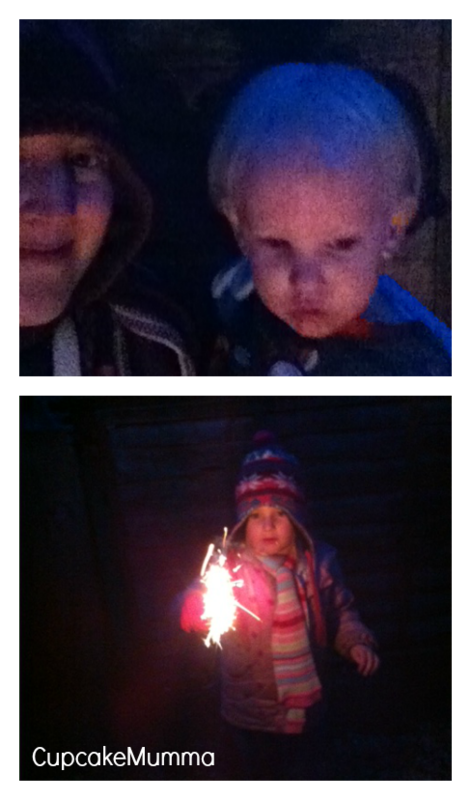 This is the second time Midge has had a go on the sparklers and she was much more confident this year. Standing there waving her hand about but watching her brother's every move was lovely to see. She did stay very close to her pot of water as well which was oh so sensible! When the children were in bed I managed to sneak outside for 5 minutes to watch some fireworks in the distance. It was quite nice having a bit of fresh air and some 'me time.' I must admit that the fireworks were totally rubbish but I was very far away so they weren't going to be amazing and were very low. Our sparklers more than made up for that though. Bonfire Night may not be my favourite celebration of the year, but I like it a lot more than I used to! What did you get up to tonight? I'd love to see your posts. I'm finding it hard to believe its been half term this week. We haven't done anything very half term like (going out to places and doing 'stuff' for example) but it seems to have just whizzed past at record speed! 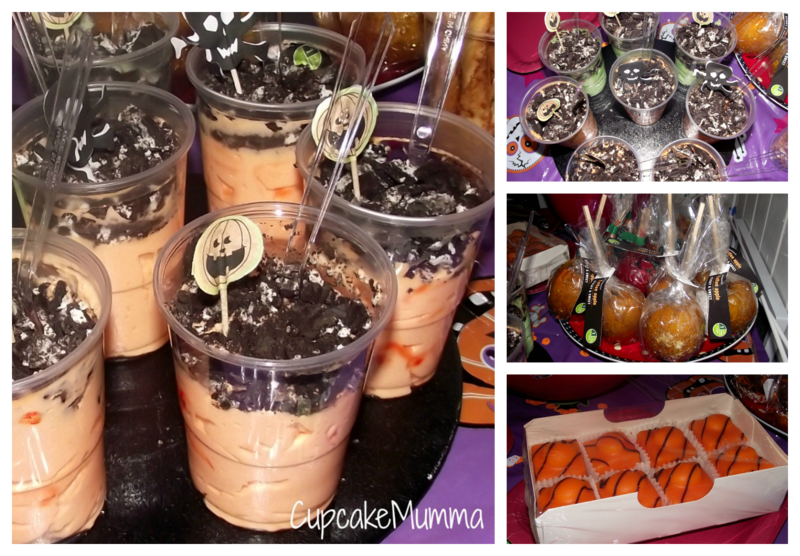 We had our amazing party on Halloween which was enjoyed by all and ended October in a really lovely way. The children hadn't been together properly for a long time since they ended up going to separate schools so seeing them all playing and bonding was just lovely. 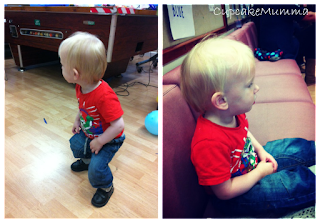 I always enjoy hosting a little get together, making sure everything is perfect for my guests big and small! 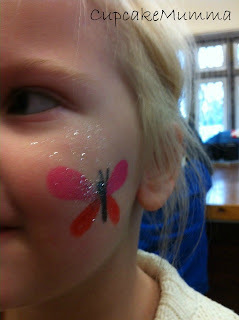 I think the day was a hit and the children seemed to enjoy it which is the main thing! We'll be going out on a walk tomorrow to collect feathers, leaves and other things as part of Midge's homework. We've been doing a bit of reading but I've noticed not actively getting her book out and reading with her everyday has set her back a bit. I feel terribly bad for this but know she'll be back up to speed in no time at all. Lesson learnt! 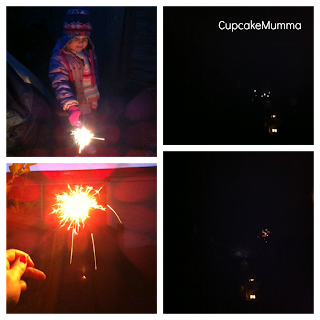 As Bonfire Night is on Monday and the Husband works evenings there will be no firework displays for my 2 this year. The reason for this is the firework display is a bus ride away now it's darker and I'm not going there on my own, in the dark with 2 toddlers, one of which I have no idea how will react to the noise! We've decided instead to a nice, low key celebration tomorrow. We'll have a tasty roast dinner, get some little sparklers and I've still got some glow sticks from the Halloween party so we'll turn the lights off and go crazy with the glow sticks! I think some crafts should come out too. What are your plans for Bonfire Night? As you can see it's not really a big deal for me. Some people hate Halloween but I'm the opposite. 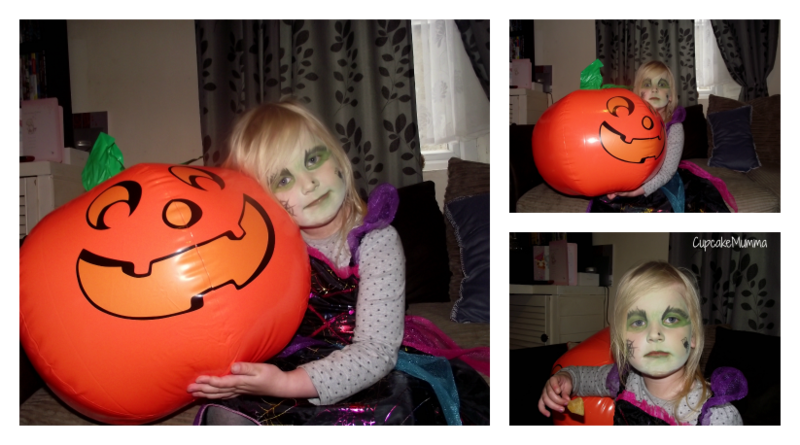 I love Halloween and quite dislike Bonfire Night! Idiots being allowed to purchase fireworks and terrible stories of people drinking too much and posting them through letter boxes has left me a bit 'couldn't care less' where this celebration is concerned. Still, there's a history lesson to be had here and if I try to celebrate in some way every year, my children will asks questions and learn about old Guy Fawkes and his plot. I shall leave you now because I have a date with a rather yummy looking rice pudding! Another month, another crafty challenge using inspiration from pinterest. This month I knew exactly what my focus would be: Thanksgiving. I know I'm not American, Canadian, German but once upon a time Thanksgiving was celebrated in England (thinking back to Henry VIII) but is long something thought of as a tradition done by our friends across the pond. My thinking, however, is that everyday I have something to be thankful for, so this year myself and my family WILL be bringing Thanksgiving into our home. Why not? I covered my cardboard in parcel paper and stuck my halved envelopes onto it. 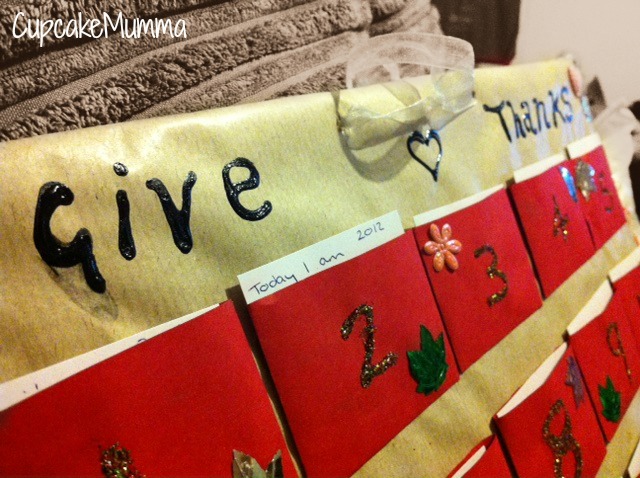 I then used glitter pens to write numbers on the envelopes to make it all sparkly and lovely. I added sequins and hearts to finish the look off before cutting white card into little rectangles and slotting them inside the halved envelopes. Midge: I am thankful for a really good sleep. Mummy: For getting all the great Christmas gifts today! Midge: For going out today shopping! 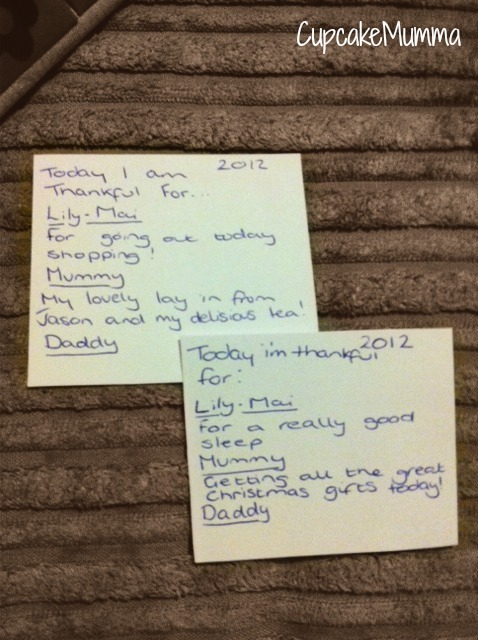 Mummy: For my lovely lay in from Daddy and my delicious tea! 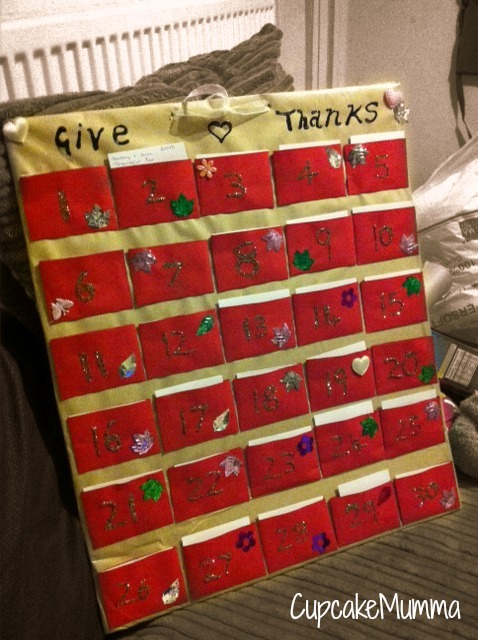 I hope you like our Give Thanks calender and view some more fab makes from my other fellow Pinaddicts! Yesterday I put on a small spread and invited my nieces, nephews and a friend from school to come and join in the Halloween fun with Midge and Little Man. I spent most of the morning and a little of the night before knees deep in food ideas, baking and decorating whilst my 2 slept soundly. It would seem all the hard work paid off as lots of little monsters left with big smiles and lots of laughter! 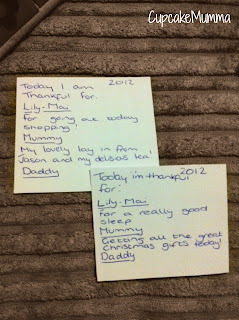 Here's our day that I couldn't wait to share with you..
We had a fairly good spread set out on the table. Lots of sweet and plenty of savory to choose from. I went with cakes, chocolate fingers and tea cakes, toffee and chocolate apples, cheese ball crisps and cheese Doritos, dips with cucumber sticks, pizzas and much more. fancies always go down well. I went all out with my Halloween decorations this year. There was bunting, tinsel and a pinata in the hallway, lots of balloons floating around the house including hanging down from my kitchen ceiling. I did this at my sisters leaving party and since then I can't stop! More tinsel was strewn throughout the house and over photos. I love a bit of tinsel me! I made some party boxes for all the children when they left. They all had little name tags on with a googly eye! Inside there was a selection of sweets (no one had to Trick or Treat after this party!) I added spider toys, little nick knacks and some glow sticks. I was quite impressed with myself so I hope the children liked them. at the party and this is what he chose. Cool huh? The final thing to show you was this pinata I've been raving about for ages. I didn't think it would be anything special because it was just a pull one. The thought of 5 toddlers bashing things with sticks was just too much to bare so I went for the safe pull a ribbon, win your sweets one! None of my monsters cared very much. My younger nephew was the winner ripping off the ribbon ('That was awesome!!' he cried) They dived in for their sweets and had so much fun. 'Grab!!' And no arguments. Hooray!! 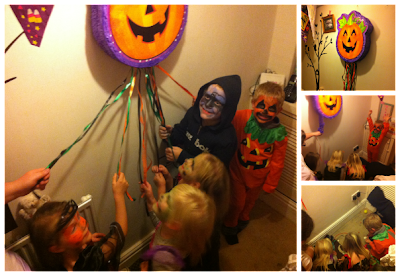 The neat thing is, I can reuse this pinata for next year with a bit of crafty touching up! My kitchen was covered in crisps (Little Man), my rug has had to be removed because of severe juice spillage (Little Man) and there is green angle delight with biscuit mushed into my carpets (Little Man) but it was a great party. I love all my Little Monsters and am already planning my next get together with them.